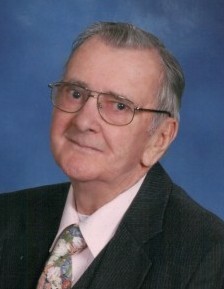 Obituary for JAMES RICHARD WESNER | Stanley J. Krish Funeral Home, Inc.
James R. Wesner, 89, Altoona, passed away peacefully on Sunday to be with the Lord surrounded by his loving family. He was born in Johnstown, son of the late Frank and Jane (Grigg) Wesner. On July 14, 1951, he married Rose Brunner at the Cathedral of the Blessed Sacrament in Altoona. Surviving are his wife of 67 years; two sons: Craig (Terri) and Kevin (Mary Jo); three grandchildren: Michael (Autumn), Kellie Wesner (Steve) Bettwy and Emma, all whom he adored; a brother, Donald; and several nieces and nephews. He was preceded in death by a daughter, Karen Louise; and three brothers: Verle, Frank, and Paul. James worked in the circulation department at the Altoona Tribune and later retired as a driver salesman from Industrial Uniform and Towel Service. He proudly served in the Korean War as a corporal in the U.S. Army, 3rd Division, 7th Regiment. He was a member of the Second Avenue United Methodist Church where he was a member of the Ray Dunn Bible Class. He was also a member of the RSVP program at the Senior Citizens Center. His hobby was carving beautiful wooden flowers, for which he was well known. James enjoyed the outdoors, and was an avid follower of all Bishop Guilfoyle sports. He was a very kind and caring person, and will be missed by his many friends who were always welcome in his home. His faith in God and love of his family were pillars in his life, and he will be greatly missed by all who knew and loved him. "Along the way, don't forget to smell the flowers." Friends will be received from 2 to 4 and 6 to 8 p.m. Wednesday, April 3, 2019, at Stanley J. Krish Funeral Home Inc., 1204 17th St., Altoona. A funeral service will be held at 11 a.m. Thursday, April 4, 2019, at the funeral home. In lieu of flowers, please make any desired memorial contributions to the Bishop Guilfoyle Athletic Department.